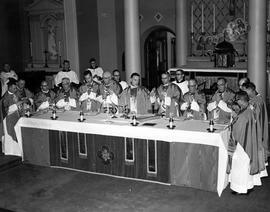 Item is a composite photograph of priests of the Antigonish Diocese. Item is a photograph of the Antigonish Diocese. Item is a pamphlet containing a version of the Catholic Catechism. One copy has some notes about the Gaelic alphabet and pronunciation inside the back cover. A Catholic catechism arranged by Bishop John Cameron of the Diocese of Arichat. Item is an October 7, 1972 issue of the Cape Breton Post Weekend Magazine (Vol. 22, No. 41). The issue featured "The Holy Town Will Have To Take Its Halo Down," a story that outlined racial issues in the Nova Scotia town of Antigonish. Item is an article aimed at describing and promoting credit unions. Item is a photograph of the football team at St. Francis Xavier University, Antigonish. Item is a photograph of the exterior of St. Francis Xavier University campus buildings. Item is a photograph of the members of the hockey team at St. Francis Xavier University, Antigonish. Item is a photograph of Lillian Brown, daughter of R.H. Brown, at approximately age 21. Item is a photograph of the Marion Bay Chair in Antigonish. Item is a souvenir from the silver jubilee of Rev. James Morrison, Bishop of Antigonish on September 7, 1937. Item is a photograph of Somers Chapel at St. Francis Xavier University, Antigonish. Item is a photograph of the St. F.X. Football Team, who were the Maritime Province Champions. Item is a photograph of the administration building at St. Francis Xavier University, Antigonish. Item is a promotional brochure for St. Francis Xavier University's extension program in 1938. Item is a photograph of the gymnasium at St. Francis Xavier University in Antigonish. Item is a photograph of the St. Francis Xavier High School hockey team, the interscholastic champs in 1920-1921. Item is a photograph of the St. Francis Xavier University track team. Item is a photograph of the St. Francis Xavier University Science Hall, Antigonish. Item is a photograph of the Library at St. Francis Xavier University, Antigonish. Item is a photograph of Mockler Hall at St. Francis Xavier University, Antigonish. Item is a campaign brochure by St. Francis Xavier's Fund Campaign. 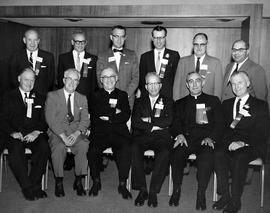 Item is a photograph of the St. Francis Xavier University Board of Governors. Item is a photograph of the St. Francis Xavier University Class of 1922. Item is the commencement address given by Angus MacDonald at St. Francis Xavier University in Antigonish, N.S. in 1946. Item is the genealogy of the Cameron clan of Antigonish, N.S. Item is a programme for a presentation of Theodore Dubois' "The Seven Last Words of Christ" by the Saint Francis Xavier Music Appreciation Society, April 1946. Item is a photograph of two women searching through drawers. Item is a photograph of the interior of a church.